Are bananas good for diabetes? 1 WHAT ARE BANANAS GOOD FOR? 1.1 Carbohydrate content of bananas. Are bananas suitable for diets of obesity? 1.5 How to eat bananas? Which bananas are the best? 1.6 When is it not suitable to eat bananas? who should not eat bananas? WHAT ARE BANANAS GOOD FOR? How many calories are there in a banana? A banana provides aproximately 90 Kcal. Carbohydrate content of bananas. Are bananas suitable for diets of obesity? BANANAS are very rich in carbohydrates, reason why they constitute one of the best ways to provide our organisms with vegetable energy. They will be very suitable for children, who need an energetic food to satiate them quickly. Equally for sportsmen or for any person that requires a healthy ” bite ” in any moment. The high amount of calories of bananas makes us to wonder if bananas can be included in obesity diets or if they can be eaten by people with diabetes. The satisfying capacity of the banana should not make us think that it is a fruit thatmakes us put on weight. So we should better not to eat many bananas if we want to maintain a thinner body. Evidently, bananas are one of the tender fruits providing more calories, about 100 for each 100 grams, which is the average weight of a Banana from Canary Islands. This number is bigger than the 60 calories that 100 grams of apples provide or the ridiculous 22 calories for each 100 gr. of watermelon. However, who is satisfied with 100 gr. of apples and with 100 gr. of watermelon? How many people do really want to eat two bananas at the same meal? Therefore, eating a Banana would be similar to eating a little more than a single apple since the weight of an apple is usually superior to that of the banana. In any case, we hardly ever think about the fact that a 100 gr. of industrial pastry products do really contribute with 400 calories and without the minerals and the vitamins that bananas can supply. Bananas are not fattening. On the contrary, for their wealth in potassium they help to balance water in the body by counteracting the sodium and favoring the elimination of liquids. Bananas are very appropriate for those who want to eliminate weight. On the other hand, the elimination of water and sodium of the body is essential for the treatment of certain illnesses, as hypertension, gout, rheumatic illnesses, etc. Potassium is also a mineral that intervenes in the good state of the nerves, the heart and the muscles. It favors recovering in states of edginess and depression, prevents the muscular cramps, strengthens the muscles, improves blood circulation, preventing clot formation and increases heart beat in cases of heart weakness. Its wealth in zinc can be profitable to strengthen the hair, helping to prevent baldness. Its content in pectin, that is bigger than in the the apple, and fiber is very interesting for the treatment of cholesterol. Studies carried out in India, a country where bananas are much consumed in form of flour to make homemade bread (chapatis), have demonstrated the power of this fruit in the prevention of gastric ulcers and its capacity to protect the intestinal mucosa. It has been proved their protective power to combat gastritis or to prevent the ulcers. They can even be used to cicatrize them. To make this possible, it is believed that cooking varieties of bananas should be used and these should be immature or very green. Many of these bananas can be bought nowadays in many establishments dried or raw, so they can be cooked or fried or whatever you prefer. 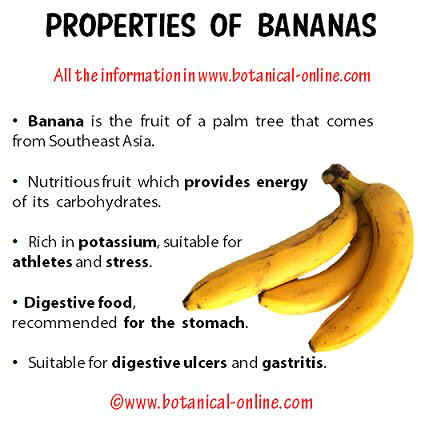 For those with problems of diarrhea, bananas, rich in tannins, can have an astringent value. A pap made with banana can be a good way to cut diarrhea in small children. Other beneficial components to detoxify our organism are vitamins C and vitamin A. Bananas present a great wealth of both. Their great contents in vitamin C, combined with its wealth in phosphorus, is ideal to strengthen the mind. Eating bananas is very appropriate in the grown-ups to delay problems of senility or in the students to increase their memory, especially in evaluation periods. Bananas are very digestible fruits, rich in components that stimulate the digestion, so it is very appropriate to combat the cases of inappetence, among them the terrible anorexia. Without being so alarming, bananas can simply wake up the appetite in children that are not very hungry, even more when they are combined with other natural foods, like apples or grapes. Equally, they go on very well with milk, so that we have the opportunity to elaborate stupendous and very nutritious milk shakes. How to eat bananas? Which bananas are the best? Bananas should be eaten when they are very mature. It is better if they have some black points on the skin without these affecting the whole surface, what will indicate that they are already too mature. 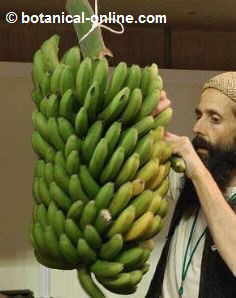 Bananas are picked up green. In the maturation process they produce their sugars and their so characteristic scents. When we buy this fruit, we should not keep them in the refrigerator because they lose their flavor and become rancid. Once peeled, they should be eaten as soon as possible because they get spoiled very quickly. When is it not suitable to eat bananas? who should not eat bananas? 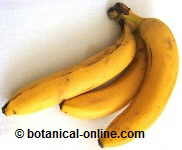 Bananas would not be eaten with liver affections, such as hepatic insufficiency. In case of arrhythmias or tachycardias we should minimize their ingestion. (More information) They are not recommended for liver disease diet. Composition of bananas per each 100 gr. Vitamin B1 (Thiamin) 0, 045 mg.